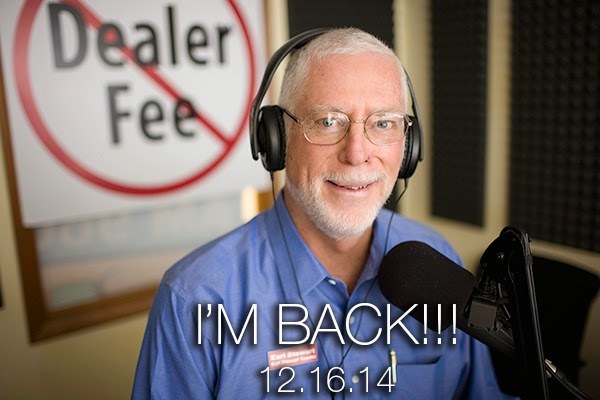 "Earl Stewart on Cars" is Back on the Radio! I consider myself pretty good with words, but I cannot fully express how happy Nancy and I are to be back on the air assisting you and all South Floridians with their car buying and servicing issues. We answered all of your questions for seven years from our live, one-hour talk show on Seaview Radio, but had to take a thirteen month hiatus from November 2013. You can tune us in any Tuesday afternoon from 4pm to 6pm on JVC Broadcasting’s, “900 The Talk of the Palm Beaches”. That’s 900 on your AM dial. Our first show is Tuesday, December 16 and if you read this blog in time, we encourage you to listen and call the show with your comments and questions. You can stream the show live by following this link Stream Earl & Nancy LIVE.Our show is live, but it will be recorded for replay on Sundays from also from 4 PM to 6 PM. I’m excited to say that our show will also be simulcast live in Long Island, NY on 103.9, LI News Radio. Nancy and I will be off the air for the holidays, Christmas Eve and New Year’s Eve, but back on again Tuesday, January 7. Nancy and I would like to thank the new owners of Seaview Radio, John Caracciolo, and Vic Canales for allowing former Seaview and current JVC General Manager, Chet Tart, to reinstate our show and expand the hours and frequency. But wait there’s more! “900: The Talk of the Palm Beaches” has ten times the power of our old Seaview station. The new signal for Earl Stewart on Cars reaches north to Vero Beach, south to Pompano, and west to Ft. Myers. We will reach, literally hundreds of thousands more listeners! Furthermore, we are adding an entire new dimension to our show with Rick Kearney, a Certified Diagnostic Master Auto Technician. Rick knows “everything” about the mechanics of automobiles. He can answer all of your questions about problems you have with your car or truck, how to be avoid being ripped off by a mechanic or service department, and how best to economically service your vehicle. For those of you who have not listened to our radio show in the past, we offer something similar to this blog and newspaper column, but more and “live” so that you can call us and answer all of your questions. You may be in the process of buying a used or new car and need advice on how to find the lowest price, what makes and models are best for you, or which car dealers can you trust the most. You may have already bought a car and would like to share your purchasing experience, good or bad, with Nancy, me, and our radio audience. You might wonder if those “extra services” that the person you take your car to are really needed or if the price they are charging you is fair. Someone once said that buying and servicing a car is like having a root canal without the anesthetic. We would like to offer you some advice that will not only act as an anesthetic, but actually turn the buying an servicing of cars into a pleasurable experience. If you listen to Earl Stewart on Cars, you will hear me quote Jim Press, the former CEO for Toyota for all of North America and the first non-Japanese to sit on Toyota’s board of directors, “The way you treat the customer when you do not owe them anything, like how you treat somebody who cannot fight back—that is the ultimate test of character.” This sums up Nancy’s and my ultimate goal which is to ensure that all car dealers and service departments in South Florida understand the truth of this statement. Hopefully by now, all but my newest readers know about the infamous “Dealer Fee”. If you don’t know, it’s a hidden price increase on the car you purchase disguised to look like a federal, state, or local tax or fee. It’s actually 100% profit to the dealer. “Dealer Fee” is the most common name for this disguised profit, but it goes by many names such as doc fee, dealer prep fee, service fee, administrative fee, electronic filing fee, e-filing fee, tag agency fee, pre-delivery fee, etc. The names are only limited by car dealers’ imaginations. 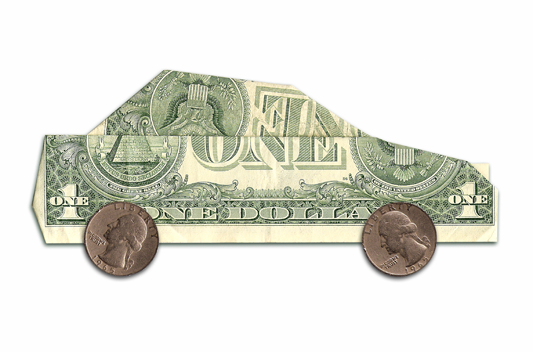 Almost all car dealers in Florida charge a Dealer Fee. The dealer fees range from around $700 to as high as $2,000! This law is very weak and almost never enforced. When enforced, it isn’t enforced by the letter of the law; it is done so as to “accommodate” the car dealers. The law is “weak” because it requires only that the dealer fee be included in the “advertised” price. The word “advertised” is narrowly interpreted to mean a specific car shown in a newspaper, TV, radio, or online ad, but, what about when you get a price on the phone, online, or from the salesman? You don’t find out about the Dealer Fee until you’re in the business office signing a bunch of papers. The dealers get around advertisements very easily by including a “number” in the fine print. This number is their stock number that designates one specific car. When you respond to the ad, this car is no longer available (sales people are usually not paid a commission for selling the “ad car). The advertisement might say “many more identical cars are available.” It’s true that identical cars are available for sale, but they are not available for sale at the sale price because they are not the advertised stock number car. If you buy one of those “exact same cars” you will pay from $700 to $2,000 more. The reason I’m told that the law is rarely enforced is that the Florida Attorney General’s office is understaffed and too busy enforcing other Florida laws. I’m also told that Florida car buyers don’t file very many complaints against car dealers for violating the Dealer Fee law. I don’t believe that there can be too many other infractions of the law that take more money annually from consumers than dealer fees take from car buyers. Just one car dealer selling 1,000 cars a year and charging a $1,000 dealer fee is taking a $1 million annually from car buyers. Most car dealers in South Florida well a lot more than 1,000 cars annually and many charge more than $1,000 dealer fee. I believe that the reason more complaints aren’t filed on the dealer fee is because most car buyers don’t know that they are being duped. They either don’t notice the fee or assume it’s an official federal or state fee. Dealer often tell their customers that all dealers charge it and that it’s required by law. The Attorney General also “accommodates” the dealers by not interpreting the law the way it was intended. For example, the law says that the dealer fee must be included in the advertised price. 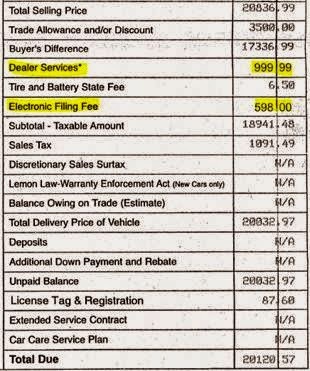 The Florida Senate has ruled that the law requires that the fee be “included” rather than “specifically delineated.” But the Attorney General allows car dealers to advertise car prices without including their dealer fee in the price if they mention their dealer fee in the fine print. They also allow car dealers to simply state in the fine print that they have a Dealer Fee but not even mention the amount. To me they are simply allowing the car dealers to break the law. Lastly, the required disclosure of the Dealer Fee on the vehicle buyer’s order or invoice is confusing, misleading, and incorrect: “This charge represents costs and profits to the dealer for items such as inspecting, cleaning, and adjusting vehicles and preparing documents related to the sale.” It should not say “costs” because any cost that you pass along to the customer in the price of a product is pure profit. A dealer can pass along his utility bills, sales commissions and advertising if he wants to and call it a “dealer fee”. It should not say “inspecting, cleaning, and adjusting vehicles” because all car dealers are reimbursed by the manufacturer for “inspecting, cleaning, and adjusting vehicles”. (1) Make it clear from the very beginning that all prices you discuss must be “out-the-door” prices. This way you don’t care if the dealer fee added up front because you will shop and compare their bottom line price with at least 3 competing car dealers. Ideally you should require that they include tax and tag in that price. If you don’t they might try to slip in something they call the “electronic filing fee” or “e filing fee” and trick you into believing it’s part of the license tag and registration. (2) The dealer will often tell you that all car dealers charge Dealer Fees and that they are required by law to add the dealer fee on every car they sell. Simply tell them that you know this is not true and you can cite me and other car dealers like Mullinax Ford who do not charge a dealer fee. Print out a copy of this article, show it to them, and tell them that you know that there is no law that says he must charge you a dealer fee. (3) As long as you and the dealer understand that the out-the-door price is the price you will shop and compare with his competition, you don’t need to be concerned whether there is a dealer fee showing on the vehicle buyer’s order. To be competitive, the dealer can simply reduce the price by the amount of his Dealer Fee and the bottom line is what you are comparing. (4) Be aware that dealers usually do not pay their sales people a commission on the amount of their dealer fee. In fact, dealers often misinform their sales people just like they do their customers. The salesman who tells you that the all dealers charge Dealer Fees and that the law requires everyone pay a dealer fee may actually believe it. Sale people who understand that the Dealer Fee is simply profit to the dealer will be resentful of not being paid their 25% commission on it. A $1,000 dealer fee costs the salesman $250 in commission. (5) When you respond to an advertisement at a specific price for a specific model car, object when the dealer adds the dealer fee. Unfortunately, the law allows him the loophole of claiming that the ad car is a different stock number, but you might be able to shame him into taking off the dealer fee. If you raise a “big enough stink”, the dealer would be smart to take off the dealer fee than claim that technicality, especially if you were to advise the local TV station or newspaper. I hope that these suggestions help you and I hope that you will file a complaint with the Florida Attorney General, Pam Bondi. If enough consumers (who are also voters) let our elected officials know how they feel about the Dealer Fee, it will bring positive results. I’ve been writing articles on why nitrogen in your tires is a waste of money for several years, but It has had very little effect on the number of car dealers that are selling it to their customers. The “Nitrogen Lobby” must be very powerful because we still have no federal or state legislation to curtail this. Selling nitrogen generation equipment and tanks of nitrogen to car dealers is very lucrative and, even more lucrative is the money car dealers make selling nitrogen to their customers. One large volume car dealer charges $398 for nitrogen in the tires of every vehicle he sells. The cost of nitrogen is about “25 cents” per application. If you feel you absolutely must have nitrogen in your tires, Costco will give it to you “free” which is exactly what nitrogen in your tires is worth. I don’t recommend that you even accept free nitrogen for this reason. It’s widely accepted and recommended that you should have your tire pressure checked in your tires at least monthly. We do this free for our customers and automatically do it at every service visit. When you are sold or even given nitrogen, it comes with a sales pitch that nitrogen will remain in your tires for a much longer time than air which is not true. Click on this link to Consumer Reports article, www.NitrogenInTiresWastesYourMoney.com. If you believe the sales pitch, you’re less likely to check your tires inflation every 30 days. You may have a slow leak in one tire from a nail or screw, uneven wear from misalignment, or even a defective tire. Being “over confident” because you paid money for nitrogen may cause these problems to go undetected. Consumer Reports estimates that 1lb of nitrogen will escape from your tires every 3 months vs. 1 month for air. Remember that air is 78% nitrogen. I’ll bet the salesman that sells you nitrogen “forgot” to tell you that. Be prepared for a great sales pitch on nitrogen. You’ll be told that NASCAR uses nitrogen in the tires of their race cars, NASA used nitrogen in the tires of their space shuttle, and that airlines uses nitrogen in airplane tires. All of this is true, but so what? A race car going 200 mph for hours and hours around an oval track subjects its tires to extremely high temperatures. 100% nitrogen gas does expand less under extreme heat condition than 78% nitrogen gas (air). The space shuttle tires go from zero atmospheric pressure in outer space to regular pressure at sea level. Airliners also have extreme pressure variations from 30,000 feet to the ground. To be perfectly fair, I must say that some car dealers that are selling nitrogen have “drunk the Kool Ade” from the nitrogen generation equipment industry. Some car dealers actually believe that nitrogen is good for your tires. But those who do know must know how much they’re marking up that 25 cents worth of nitrogen they’re selling you! The argument for nitrogen can be persuasive. In fact, when the concept was first introduced, before the Consumer Reports study, I actually considered adding nitrogen to my customers’ tires. But, in an abundance of caution, I decided to test the claims about nitrogen myself. Over a six month period I used pure nitrogen in 50% of my rental car fleet and regular air (78% nitrogen) in the other half. Guess what! There was no measurable difference between the pure nitrogen and air filled tires in the fuel economy, tire wear, or inflation pressure after 6 months. We did check the tires every 30 days for slow leaks from road hazards, uneven wear from misalignment or other reasons, and we rotated and balanced the tires every 5,000 miles. Finally, I’ll tell you why I was so careful to be sure there was no advantage to nitrogen. My dealership has a “fee tire program”. Everybody who buys a Toyota from me, new or used, receives free tires (maximum of $700 per set) for as long as they own their car. The one requirement is that they bring their car back to me for the factory recommended service and we replace only tires from normal wear, not road hazards, underinflating or misalignment. I give away over $100,000 worth of tires every month, well over a million dollars per year. BELIEVE ME, if I thought I could get longer wear from a tire for “25 cents” worth of nitrogen, I would! I look at the tires on my customers’ cars as “belonging to me” because I incur the cost of replacing them when they wear out. Should I Trade In My Old Car or Sell It Myself? When you trade your old car in on your next car, the dealer will try to retail your car or sell it at auction for more than he allowed you in trade. If he successfully retails your car, he will make about $2,000. If he wholesales it at the auction, the profit will be less. You should know that this is what the dealer wants to do. Sometimes it doesn’t work out that way and he will actually lose money on your car at the auction. Or, he may be unable to retail your car and then most certainly lose money when he is forced to wholesale it. Obviously it is more difficulty for an individual to make a profit by selling her own trade-in than it is for the dealer. That is one of the main consideration you must consider before deciding to sell your old car yourself. Most people run an ad in the local paper and/or online to advertise their trade. If you do this, you need to know what to ask for your car and I recommend consulting www.kbb.com. This is Kelly Blue Book’s Web site and will tell you about what your car is worth wholesale and retail. Another way to determine this is to ask dealers for your make of your car what they will buy it for. This will establish the wholesale value. CarMax is a good company to consult if there is one near you. Once you establish the wholesale, you should consider a markup of less than what car dealers are asking. When deciding how much profit you want to make, remember that you are losing the sales tax reduction that you earn when you trade your car in. On a $20,000 trade, that amounts to $1,200. If you can make a $2,100 above wholesale, you are ahead of the game by $1,000. This takes a lot of work and you will be dealing with a lot of “tire-kickers” and people who cannot afford to buy your car. I very strongly advise you not to extend credit. Require full payment in cash. Set a time limit on how long you will try to sell your car. Remember that your used car is depreciating every week and your cost of advertising will climb. I wouldn’t suggest you hang on to your old car for more than a month. Ebay is a good alternative to advertising your car in the newspaper. A lot of car dealers use Ebay to retail used cars and it is very effective. There are schools on how to retail merchandise on Ebay and Ebay has tutorials. There are also a lot of books at any bookstore on this subject. There are companies who will do all of the work for you and you only pay them a fee if they are successful in selling your car. If the dealer you are buying your new car from sells cars on Ebay (most do), you can ask him if he will post yours Ebay along with his cars for a fee. If you fail in your attempt to retail your old car, remember to be careful to maximize the amount you get from your dealer as trade-in. Often times dealers will attempt to trade a car in for below wholesale. Be sure you have a firm handle on the true wholesale value of your trade. You can get bids from other dealerships to purchase your car for cash and you can check with www.kbb.com. If you are buying a car from a dealer franchised to sell a different make than your trade-in, be wary. This dealer will likely be unable to offer you as much as a dealer who is franchised to sell the make of your trade. People looking to buy a used Toyota are more likely to visit a Toyota dealership than a Chevrolet dealership. That is why it’s important to get bids from other dealerships before accepting the trade-in offered by the dealer you’re buying your new car from. When you bought your last new or used vehicle, did the salesman encourage (or even insist) that you drive your vehicle home that same day? The chances are very good that he did because Florida dealers and those in most other states have a firm policy of doing this. I’ll estimate that 90% to 95% of all cars sold in Florida are “spotted” which is the slang expression dealers have for this policy. A few states, like New York, make it illegal to deliver a newly purchased car until the tag, title, and registration process have been finalized which delays the delivery for a few days. As much as you may be tempted, these are 5 reasons you should not sign the papers and drive the newly purchased vehicle home the same day you decide to buy it. Some car buyers are under the impression that there’s a 72 hour “cooling off period” mandated by law that allows you to return purchases, but this is not true when you buy a car at the dealership. It applies only if you purchase the product in your home. (1) If you’re financing the car through the dealer, there’s a chance that your financing has not been approved based on the same terms, interest rate, and down payment you agreed to. If you bought the car on a weekend or after 5pm, most banks and credit unions are closed. Even if you bought it earlier during a weekday, it can take a day or more for a bank to do a thorough credit investigation and approval. If your credit is later turned down or the down payment, interest rate, or terms modified, you will be faced with the embarrassing necessity of returning the car and resigning a contract that will result in you paying more money than you had agreed to. (2) Most cars, surprisingly, are purchased on impulse with emotion overcoming logic. The 2nd largest expenditure the average person makes in their life is for their car. This decision should be made with logic, not emotion. Logic dictates that one should spend several weeks studying the pros and cons of the many different vehicles available. The Internet offers a wealth of information. Should you lease or buy? Should you buy a late model used car or a new one? Which dealer offers the lowest price? 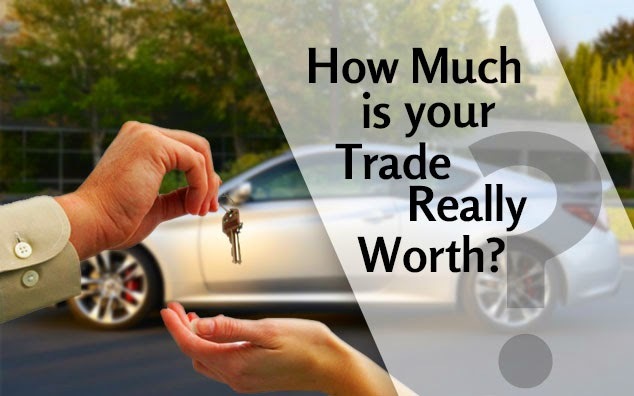 Which dealer offers the highest price for your trade-in? Which bank or credit union offers the lowest interest rates and terms and down payment acceptable to you? You should never buy a vehicle without an extensive test drive. (3) The dealer may be insisting that you take delivery immediately because he knows that this is the best way to force your emotion to overcome your logic. When you take your new vehicle home and show it off to your friends, family, and neighbors, you’re far more likely not to change your mind. Because you’ve left your trade-in with the dealer, you’re not going to be checking prices with other dealers. 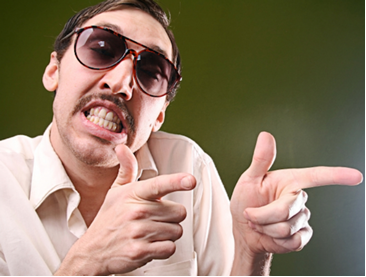 Taking you out of the market by keeping your trade in has a slang term among dealers…you’ve been “de-horsed”. Taking that new car home the same day also has a slang term…you’ve been “puppy-dogged”. Have you ever gone puppy shopping with your family and brought home a warm, cute, and cuddly puppy? What are the chances you’ll return her the next day because the price was too high? (4) A legally binding contract must have “offer and acceptance.” Taking your car home completely binds the acceptance of the contract, if you signed one, and makes it far less likely that you will be able to get out of the deal you made. (5) Unscrupulous car dealers will spot deliver cars knowing that the lender will not approve the low interest rate, low down payment, and longer terms that you have agreed to. They’re relying on the fact that you’ll fall in love with your “new puppy” and that you’ll brag to your family, friends, and neighbors how about the low price, low interest rate, etc. that you negotiated. When you get that call from the finance manager at the dealership a few days after delivery that you must come back to “take care of a little more paperwork”, you won’t hesitate. When you get there, you find out that you have to come up with a lot higher down payment, a much higher interest rate, and tell you that you have to buy an extended warranty because “the bank requires it”. Your monthly payment goes way up and so does the dealer’s profit. The dealers have a slang expression for this too…it’s called the “yo-yo delivery”. If you find yourself in the position of being told to return your purchase because the bank requires a higher interest, higher down payment, or shorter terms be sure that you understand that you have no obligation to sign a new contract and keep the vehicle. Your contract is null and void. There’s even an argument to be made by you and your lawyer that the first contract is valid and that you can keep the car at the original terms agreed upon. You may have signed a paper, typically referred to as a “Recession Agreement”, which purports to require you to return the car if the bank refuses to honor the contract as written. There are financial penalties if you don’t. This was common practice with all Florida car dealers for many years but court decisions, case law, has made this a very questionable practice. I hope that this never happens to you but if it does and you decide you want to keep the car under the terms of the original finance contract, I recommend you hire a lawyer. Recently, I sent a mystery shopper into a Kia dealership in West Palm Beach. Her assignment was to respond to TV, radio, and Internet advertisements to buy a new Kia Soul for $179 per month or “less than $6 per day”. We give our mystery shoppers code names to protect their real identities because most car dealerships listen to my weekly radio show. This shopper’s code name is “Agent K”. Agent K told the sales person who greeted her that she was responding to the advertisement for a new Kia Soul for only $179 per month. The salesman led her over and showed her the advertised car and as they walked over to the car he said “the advertising for this car is not all true”. Interestingly, a comment like this from car salespeople is not unusual. The sales people don’t write the advertisements and are not responsible for the sales tactics of the dealership they work for. Many are apologetic and do not like to have to explain unfair and deceptive advertisements to their customers. They are the ones that have to face angry customers when they find out that the advertisements aren’t true. Jobs are hard to come by these days and I can almost understand why someone might compromise their ethics to put food on their family’s table. The salesman explained that the advertised car was a stick shift. He also explained that she would have to make a cash down payment of $4,000 and make monthly payments for the next six years and three months. Furthermore, she would have to have a credit Beacon score of at least 750 to qualify for the 2.79% interest rate they used to calculate the low payment. The salesman asked Agent K if she would like to take a demonstration ride in the new Kia Soul but she responded “no” because she had already test driven one at another dealer. She didn’t tell him the real reason she wouldn’t test drive it was because she didn’t know how to drive a stick shift. Of course, this is the exact reason that car dealers advertise cars that don’t have automatic transmissions because 99% of car buyers don’t want to buy a stick shift and most have never driven one. Another thing that the car salesman did not tell Agent K was that there was only one car available at the advertised price. This was not clearly disclosed in the advertisements but indicated only in the very fine print by a “stock number”. The stock number for this bait and switch car was 130940 which is probably the last six digits of the VIN. The only way I was able to view this number was by looking on the Internet ad, printing it out, and then using a magnifying glass to read it. It is literally impossible to read the fine print on the TV advertisements and impossible to hear the disclosure on the radio advertisements. The fine print on TV appears only for a second or two as a blur on the bottom of the screen and the radio audio disclosure is deliberately obfuscated by speeding up the sound track and lowering the volume. The reason that car dealers use a stock number in the fine print is so that they can abide by the Florida law that requires that the dealer fee be included in all “advertised” prices. This anemic law resulted from the powerful lobbying of the Florida Automobile Dealers Association, FADA. This means that a salesman can quote you a price on new car in person, on the phone or via email without disclosing that there is an extra charge (without limit!) that he can legally add after you have agreed to buy the car. A car dealer must only tell the truth about the full price of his cars when he advertises that specific car. The Kia dealer in West Palm Beach has three dealer fees totaling $971.45. 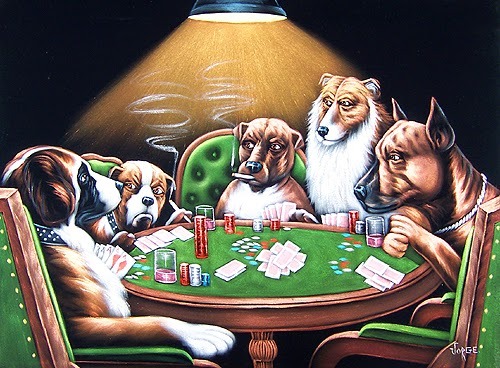 He doesn’t name any of them “dealer fee”. Florida law allows dealers to name this extra, hidden profit anything they choose. This just makes it easier for the car dealers to hide this hidden profit from their customers. The Kia dealer decided to name one of his dealer fees “delivery fee” and it is $699.95. He probably chose this to make the customer believe that this was for inspecting, washing, and adjusting the new car. What most customers don’t know is that these costs are actually paid for by the manufacturer. His second dealer fee he chose to name “document and handling fee” and in the fine print on his buyer’s order says it’s “preparation, processing and handling of the documents required in registration, filing and licensing of the vehicle” and this extra profit to him is $218.55. This West Palm Beach Kia dealer does have expenses for processing and handling documents. He also has expenses for his monthly utility bills, sales commissions, and lease payments for his building, not to mention his deceptive advertising. But businesses are supposed to include all of their expenses in the prices of the products they sell. They are not supposed to tell you the price and then make you pay their expenses on top of that price. The third dealer fee this Kia dealer chose to name Electronic Filing/Private Tag Agency Fee which amounts to $64.95. He does pay a company to process his tag work but he doesn’t pay them $64.95. It’s $10 or $15 and then he marks it up and adds this to his profits. You’ll notice that all of the dealer fee names have something in common. They all end in “fee”. 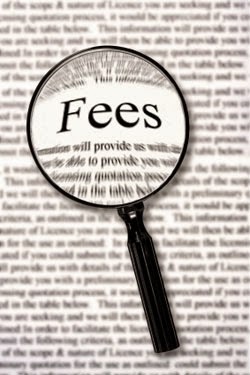 This is by design because the word fee has an official sounding sound about it. This is to lead you to believe that all of these fees are federal, state, or local taxes or fees. One way to detect real fees from additional profit to the dealer is by whether or not the dealer charges you sales tax on that amount. He is required by law to pay Florida sales tax on the full, true selling price of the vehicle which must include his all of his profit and expenses except for tax and tag. Just as an aside, I’ll also mention that this dealer marks up the manufacturer’s suggested retail price, MSRP, sticker on all of his cars by $2,999. He places this addendum label next to the official Monroney sticker and calls the extra markup “Regional Market Value Adjustment”. This is actually reduction from a few months ago when his “Regional Market Value Adjustment” was $6,999! Dealers do this so that they can offer inflated discounts and trade-in allowances. This practice is clearly in violation of spirit and intent of the federal law mandating that a Monroney label be placed on every new car to afford buyers a common basis for comparing prices. I hope Pam Bondi, Florida’s recently reelected Attorney General, reads this article. I think I know how she would feel if a relative or friend of hers were victimized by this dealer or one of the other Florida car dealers, most of whom use the dealer fee and the “phony Monroney” to overcharge their customers. Maybe she would join me in mystery shopping some car dealers to learn how Florida car buyers are being victimized and then do something about it. 1. Stop charging your dealer fee (a. k. a. delivery fee and doc fee). This fee is really profit for the dealer disguised as an official fee charged by the state or federal government. When you quote a customer a price, it should include all charges except for sales tax and license fees. State law in Florida does not prohibit this or even put a cap on this fee as many other states now do, but it’s just the wrong thing to do. 2. When you advertise a car at a price, clearly disclose to the reader how many cars are available at that price. Dealers get around the law by listing a stock number next to the car, as if this is will explain to the reader of the ad that there is only one available at this price. 3. Don’t advertise a large discount on a car unless the discount is from MSRP. Dealers advertise huge discounts from prices that are artificially inflated. What good is a $15,000 discount if the dealer has a $15,000 markup above MSRP on that car? 4. Don’t pander to folks with bad credit and give them false hope. Tell those with bad credit that if their credit is too bad, you cannot obtain financing for them. When you advertise…”No credit or Bad Credit is No Problem” you aren’t telling the truth. When you advertise that “no credit application is refused”, you are misleading the customers to think that no loan is refused because of bad credit. You are not telling them the truth. 5. Don’t advertise that you can sell used cars as low as $99. There is no such thing as used car that can be profitably sold for $99. The scrap metal or the parts on a car that cannot run or is totaled in an accident is worth $150 or more. 6. Have a heart! I received a call this morning from the son of an 81 year old man who had been diagnosed with bipolar disorder and committed to a mental health institution under the Baker Act. The day before he was committed, his father bought a brand new car for $32,000+ from a well-known South Florida dealer. The son read my column instructing those with a problem with a car dealer to call the owner or the general manager before taking legal action or notifying the press. When he tried this, he was stonewalled by both the general manager and the president of the dealership. His father had bought the car the day before he was committed to an institution under the Baker Act. This is not only heartless but just plain stupid. What do you think this will do for that dealer’s reputation when their customer’s son contacts the local TV stations and newspaper? 7. Be accessible to your customers. You might think that you own and operate a pristine business that never offends or takes advantage of anyone, but you can’t be sure about that if you insulate yourself from your customers. You might be amazed at what you find out when you speak directly to your customers and even to those who wanted to be your customer but changed their mind for some reason. 8. Don’t surprise your service customers with a “miscellaneous supplies fee”. Sometimes this is called an “environmental fee”. The price you quote your service customers should be the price they pay…not that price plus 10% which is pure profit to the dealer. 9. Don’t mark up your “hot models” over MSRP. The manufacturer’s suggest retail price affords the dealer very generous profit margin. Don’t exploit the temporary situation where demand for that hot model exceeds supply. This is no different than some gas station operators do during fuel shortages before and after hurricanes. 10. Do away with the fine print. If there is something important that is worth reading in your ad, print it in a font size that can be read without a magnifying glass. If it’ not important, don’t put it in the ad. The only reason for fine print in a car ad is to hide something that you don’t want the reader to find. I’m sure that you noticed that the last time you went car shopping you were unable to get a firm price on the car, unless you were willing to sign on the dotted line and put down a deposit. It’s impossible to get a firm price on a car over the telephone, and very difficult to get one via email. If on the off chance you’ve never bought a car, or haven’t bought one in a long time, try this. Call any car dealership and ask for a price on a specific year, make, and model. I can almost guarantee that you won’t be able to get a firm price. Have you ever wondered why you can get a firm price on just about any other product except an automobile? You can call a jewelry store and get a price on a diamond ring that costs as much or more than a car. You can go on Amazon.com, get a firm price, and buy virtually anything. Walk in or call any department store and they give you a firm, out-the-door price. Car dealers don’t want to give you a firm price because they want to deprive you of your rights in our American free-market economy. One of our important American freedoms is to be able to shop and compare prices so that you can choose the best one. There are some countries where the prices are dictated by the government or giant cartels. We have anti-trust laws in America that prohibit price fixing, monopolies, or collusion between companies which keep prices artificially high. In fact, there’s even a federal law that says auto manufacturers must put a sticker on all vehicles that discloses the Manufacturer’s Suggested Retail Price, MSRP. This law was written by Senator Mike Monroney back in 1958. Senator Monroney felt there was a need for this law because, before then, car dealers could ask any price they wanted for car. They could put their own price sticker on their cars and mark their cost up any amount they chose. A car-buyer, pre 1958, had absolutely no basis for comparing prices between competing car dealers. The MSRP gave every car shopper a common basis for comparing discounts from MSRP. All dealers pay their manufacturers the same price for a car and all MSRP’s for a specific year-make-model have the same percentage markup. The Monroney label was a great idea and it worked fairly well for a while, but it wasn’t too long before the car dealers figured out ways around this “handicap” to their profit margins. The easiest way around an MSRP is simply to refuse to give the customer a firm discount unless they agree to buy the car, and this is why you can’t get a price from a car dealer until then. Another way is to give you a firm discount but add hidden charges like dealer fees, doc fees, electronic filing fees, or dealer installed accessories after you agree on the discount from MSRP. “Bait and switch” is a popular tactic which simply brings you in to buy a specific car only to find out that its “just been sold”…but here’s another one almost like it. Another popular tactic is to advertise discounts from “list price”, “dealer list price”, or “sticker price”. Dealers even have counterfeit Monroney labels printed that they display alongside of the real Monroney label. These counterfeit price stickers I’ve named “Phony Monroney’s”. I’ve seen advertisements from Napleton Chrysle-Jeep-Dodge in North Palm Beach last Saturday, advertising “$10,500 Discounts on Every Vehicle in Stock”. The discounts aren’t from the MSRP but from “dealer list” which is clearly thousands of dollars above MSRP. The best defense against all of this is to insist on an out-the-door price. Explain the following to the sales manager at the car dealership. “If you give me an honest out-the-door price, I will compare it with the two prices I already have from two other car dealerships. I will buy from the dealer with the lowest price. If you agree to give me your best price, you have a 33% chance of selling me a car. If you refuse to give me a price right now, you have 0% chance of selling me a car, because I will walk out that front door and you will never see me or hear from me again.” You can accomplish the same thing over the telephone or via email. I recently received an email from a very smart man and a reader of this column who was recently victimized by a car dealer when he leased a Mazda. The dealer had added a second dealer fee, calling it an “electronic filing fee” into the capitalized cost of the lease. He found this particular dealer through TrueCar, a vehicle purchasing referral service that I’ve recommended in this column. In full disclosure, I’m a member of TrueCar’s national dealer council and a stockholder. This man’s experience reminded me of the fact that leasing is far more complicated than buying a car. It also reminded me of the old saying, “If you sit down at a high stakes poker game, look around the table and can’t find the ‘sucker’, then you’re it.” When you walk into a car dealership (high stakes poker game) you can be sure that the salesman, sales manager, and F&I manager all know far more about leasing than you do. I’m not suggesting that you shouldn’t lease a car because sometimes leasing can be better than buying; but buying is easier to understand and therefore you’re less likely to be taken advantage of. I’m going to assume that you understand how to buy a car. I recommend that you determine the exact year-make-model vehicle you want and determine the exact MSRP, manufacturer’s recommended retail price. Once you’ve done this, get at least 3 bid from three dealers. This is best and most easily accomplished using the Internet. I also recommend that you use www.TrueCar.com. Unfortunately, TrueCar currently gives only an estimated lease payment but will shortly be making available a firm one. When using TrueCar for a purchase price, be sure that you go beyond the TrueCar lowest price estimate page and view the True Car Buying Certificate. The estimate page does not disclose additional dealer fees, dealer installed accessories, or anything else the dealer will be adding to his “TrueCar price”. You can see these extras when you go on to the page that shows you the TrueCar buying Certificate. But even then, you must be careful when you visit the dealer who appears to have the lowest price or payment. This is how the “very smart man” that I mentioned in the first paragraph was tricked. He did get the final price including dealer fees, but the dealer lied to him and added another fee disguised as an official fee. The dealer called this an “electronic filing fee”, yet it was just another dealer fee in disguise. It’s important to mention here that I fear that some buyers hesitate to navigate to the TrueCar page with the price certificate because doing so requires revealing one’s identity and contact information to the dealer. However, if you want to maintain your anonymity, you can always use an alias, make up a phone number, and create a different email address. Now, back to leasing. When you have received your bids from three dealers, make sure you have information about the three most important variables in leasing for you to compare. The first is “capitalized cost”. This is the selling price of the car. Next you have to compare the “money factor” which is similar to the annual percentage rate on a purchase contract. The final factor in determining the lowest lease payment is the residual value of the car you’re leasing. The residual value is what the lender forecasts the vehicle to be worth at the end of the lease. While the capitalized cost and money factor should be low, the residual value should be high. You want to lease from the dealer that offers you the lowest capitalized cost, money factor, but the highest residual. This sounds like a lot of time and work and it is. A quicker way would be to competitively shop the lease payment with at least 3 dealers just like you did the price. If you do this, just be sure you are using the same length of lease e.g. 24 months, 36 months, or whatever. Also be very sure you are getting the lease payment quote on the exact same car (same MSRP and identical options) from each dealer. It’s probably obvious by now why you can so easily be taken advantage of when leasing. Dealers and manufacturers will strongly encourage you to lease rather than buy. Lease advertising far outweighs purchase advertising. There are two important reasons for this. First, car dealers can make a lot more profit on a least than a purchase. Secondly, when you lease a car you must return the car to the dealer after the lease period is over. This gives the dealer and the leasing company total control (you don’t own the car; the leasing company does) and a better chance of leasing or selling you another car. Even when prospective customers come into a dealership to buy, they will be “strongly encouraged” to lease. I’m called by customers of other dealerships who thought they’d bought a car only to find out they’d signed a lease contract instead! Nevertheless, a lease when negotiated skillfully can be just as good a deal as a purchase and sometimes better. A lease special by the manufacturer is almost always a very good deal if you do your homework on the capitalized cost. The rate and the residual are set by the manufacturer, but the dealer can inflate the capitalized cost. Please remember to be sure the low price you negotiated is the same as the capitalized cost on the lease contract. "Total Transparency Pledge: As a TrueCar Certified Dealer, “Dealer’s Name” is committed to total price transparency. This means “Dealer’s Name” discloses its dealer fees and commonly installed dealer accessories in its pricing estimates. Call 1-888-TRUECAR if you have questions or concerns. The pain of buying a used or new car may be greater than the pain of having it serviced, but you need to have it serviced far more often than you have to buy a car. Below, I am listing eight suggestions to make your visit to your car dealer’s service department as pleasant as possible. Choose the dealer with the best service department. Remember that you don’t have to have the same dealership service your car that sold you your car. You probably bought your car from the dealer who gave you the best price. You should have your car serviced at the dealer who can best maintain and repair your car. The price of service is important, but secondary to the quality of the service and repairs. Do a little research and “Google” the name of the business and read the online reviews on their Google+ page, on Yelp, Edmunds.com, etc… Choose a service center with a large number of positive reviews. Check with the BBB and the County Office of Consumer Affairs. Ask the service manager at the dealership to show you his factory score on CSI (customer satisfaction index). Every manufacturer surveys dealers’ service customers and ranks that dealer by how well he treats his customers. 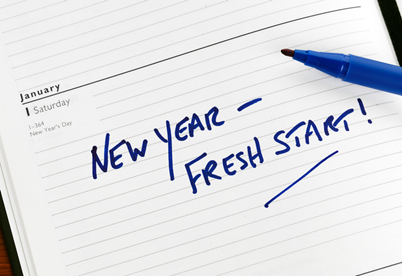 Establish a personal relationship with your service advisor. The person in the service drive who writes up your repair order is very important. Be sure you get a good one. He should be knowledgeable, attentive to your needs, promptly return phone calls, and recommend only necessary services. You might not find this person on your first visit, but if you aren’t comfortable with the person you are dealing with, ask for one with whom you are. When you make an appointment to have your car serviced, always ask for that service advisor. Don’t pay the “gotcha”, miscellaneous supplies fee. Almost all car dealers tack on a phony fee when you pay your bill which is simply more profit to the dealer, but is disguised by various labels. It is also sometimes called “environmental impact fee”, “sundry shop supplies” and many others. The cashier just adds a percentage ranging from 5% to 10% to your bill. This is no different than the “dealer fee” that the sales department tacked on to the price they quoted you on the price of the car. Most dealers will waive this fee if you complain about it, especially if you threaten to call the BBB, their manufacturer, or the Florida Attorney General’s office. You can contact the Attorney General of Florida, Pam Bondi, at www.MyFloridaLegal.com. Always road test your car, preferably with the technician. If you brought your car in for a drivability problem such as a noise, vibration, or pulling to the right or left, don’t accept the car back until you ride in the car with the technician or service advisor and confirm that the problem has been remedied. I also recommend that you drive the car with the service advisor to demonstrate the problem when you bring it in. Experiencing what you experience always communicates your problem more accurately than listening to your description of the problem. Ask for a written estimate of the total cost of repairs and maintenance. Florida law requires that the dealer give you a written estimate. By law, they may not exceed this by more than 10%. Make an appointment ahead of time. You should insist on making an appointment and you should try to make that appointment at a time when the dealer’s service department will be least busy…typically the middle of the afternoon on weekdays or Saturday and Sunday. Avoid the 7:30-8:00 morning rush. 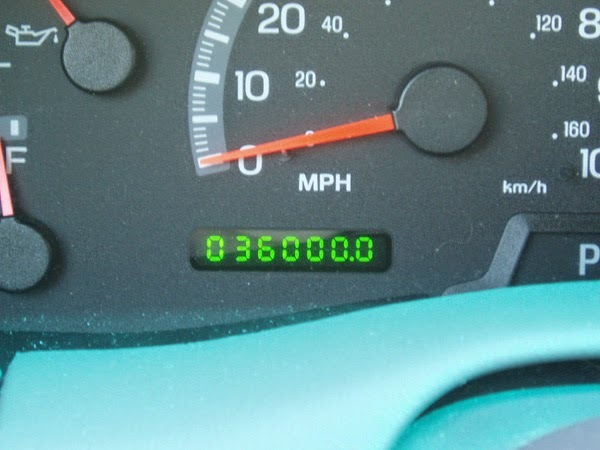 When your service advisor has written up your repair order, ask him how long it will take. After he tells you, ask him to let you know ahead of time if, for any unforeseen reason, your car will not be ready in the promised time. Often times when you call a service department they will tell you to “bring the car in anytime” or “come right over”. Service advisors will tell you this because they are either too busy or too lazy to take the time to make a proper appointment. When they tell you this, tell them that your time is very valuable and that you insist on an appointment at a time when they can get you in and out quickly. Always write down the name of the person that gave you the appointment. Shop and compare high cost repair prices. Most service departments are competitive on maintenance items like oil changes, wheel alignments, and tire rotations. However, the costs of major repairs can vary considerably. If you are looking at an air-conditioner, transmission, or engine repair that can cost several thousands of dollars, get bids from more than one service department. Often just suggesting that you will do this will keep the cost down from the dealership you prefer. Introduce yourself to the service manager. This falls along the same philosophy as developing a good personal relationship with your service advisor. It can’t hurt to know the “boss”. If you are on first name basis with the service manager, it just might earn you a slightly higher level of treatment from those that work for him. Servicing your car is just as scary as it probably was buying it, but you only have to buy a car every 4 or 5 years, maybe even longer. During the time between buying one you should bring it in for service at least a dozen times, and that doesn’t even count repairs. Car dealers make more money servicing your car than they do selling you one. The more service they sell you, the more money they make. Today’s automobiles are of far better quality and require far less maintenance than those of 20 years ago. Requiring less maintenance and repairs is a threat to the car dealers’ most profitable department. One way they can overcome this is to simply sell you more service than you really need by convincing you that it’s necessary. Did you know that virtually every employee in a service department gets a percentage of the total amount of service he sells? The guy that writes up your service order when you drive in is on commission. They are service “salesmen” but they don’t like to be called that. Their title is usually “service advisor” or “assistant service manager”. The mechanic that fixes your car is on commission. The service manager that supervises the mechanic and the service salesman is paid on commission. After the service salesman sells you as much service as he can, the mechanic’s role is to find anything that needs to be fixed on the car that the service salesman or you were unaware of. He then calls the service salesman and tells him about the additional repairs you “need”. I recommend that you stick to what your car’s manufacturer recommends for maintenance in your owner’s manual. When your service salesman tells you what he recommends, be sure that the manufacturer recommends it too. There are some exceptions to this, based on certain local environmental conditions, but very few. Always question any service not recommended by your owner’s manual. When a repair is recommended that you were unaware of, get a second opinion from another service department, especially if it’s an expensive repair. Now, don’t get me wrong; just because people are paid on commission doesn’t make them dishonest or uncaring. However, if there’s a “rotten apple in the barrel” he will take advantage of a commissioned pay plan to maximize his earnings. There are very few companies with zero “rotten apples”. 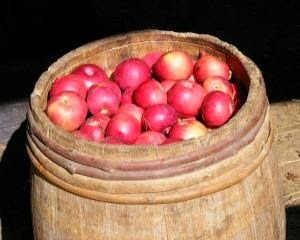 A good company does its best to ferret out the rotten apples but it’s a constant battle. In fact, there are companies that have more rotten apples than not. When you have a department or company where everybody is on commission, it takes an awfully altruistic manager to fire a top-producer. The more his “rotten apple” sells the more money the supervisor earns. This applies also to the “supervisor’s supervisor, all the way up to the guy that owns the company. The higher up the ladder you go, the harder it is to identify these more passive, unseen rotten apples that “aid and abet” the front-line apples. The head guy usually has what many CEO’s insist on…DENIABILITY. You hear a lot about that in government scandals. The press always wants to know, “Who knew what and when did they know it?” Everybody remembers Watergate where the rotten apples extended from the bottom of the barrel all the way to the top. It took Bob Woodward and Carl Bernstein over several years to follow the tracks all the way to the top of the barrel. More often than not, there are people in all companies that are honest and caring for their customers. The point of this article is that you’re better served to look for that good person than only look for a good company. There is no surefire way to do this, but I can suggest a few methods. Clearly, you’re more likely to find a good service salesman in a company that has a good reputation. You find good companies by personal experience, recommendations by friends, and ratings by various services like Google (most reliable), Yelp, Dealer Rater, and BBB. If you read the reviews, often the individuals are mentioned. 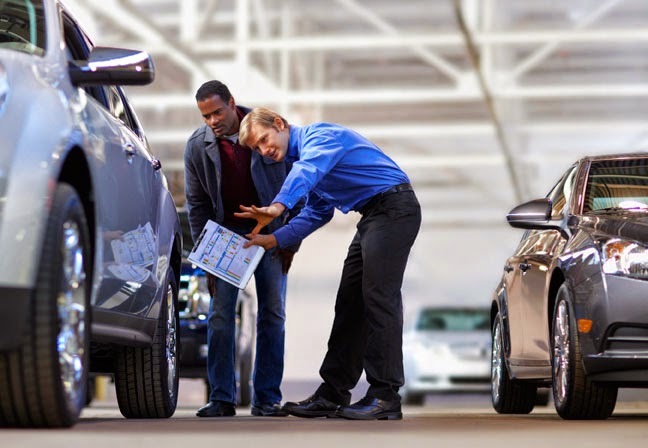 If you’ve dealt with this company before, others in that company, like the salesman sold you the car, can refer you to a particularly good service salesman. All manufacturers measure the customer satisfaction index of every service salesman. Insist on seeing these scores and find out how the service salesman ranks among his peers, both in the company and the entire region. Finally, always make an appointment to see that service salesman you’ve chosen. If he’s on vacation or not available for other reasons, wait for your service until he can see you. Finally, when you find yourself a “good apple” for a service advisor, don’t keep it a secret. Tell all of your friends and tell the service manager and the owner of the dealership. When you do this, you’re doing your friends, the service advisor, the service manager, and the owner a great favor. You’re also spreading the word that treating customers with honesty and compassion is good for business. (1) Be sure that you buy the right, type, make, and model vehicle for you. The best reference source for this is Consumers Reports magazine also available online. Even if you’re sure that you know the exact vehicle you want, be sure to take it for an extensive test drive…a minimum of a few hours. You may have owned several Chevrolet Impalas over the years and love them. The new model Impala may have some changes that you aren’t happy with. Never, never buy a vehicle, used or new, without driving it first. You would be surprised how many people make this mistake. (2) Once you have chosen the type, make, and model you want, carefully choose the options and accessories you need. Always try to buy factory installed, rather than dealer installed, options. If you have no choice, be very careful that the dealer installed accessory is one of quality, is necessary and is worth the money you’re being charged. Dealer installed accessories normally have gigantic markups (200%+ is common) and are added to the car for only one reason…to increase the profit on the car you chose to buy. Some examples are nitrogen in tires, “protection packages” including paint sealant, fabric protection, emergency road assistance, etc., window etching, and pin stripes. (3) Now that you know the exact vehicle you will purchase, you can calculate the exact manufacturer’s suggested retail price (MSRP) for that vehicle. Knowing the MSRP allows you to find the biggest discount from MSRP. Be very careful not to let a dealer substitute their retail price for the MSRP. This is a common trick in advertising when they refer to their retail price as “dealer list”, “list”, or “sticker”. Most dealers add “addendum stickers” alongside of the MSRP sticker. This is so they can inflate the markup of the true MSRP and make you believe you’re getting a bigger discount than you really are. The true MSRP is displayed on a federally mandated window sticker called the Monroney Label after Senator Mike Monroney. He spearheaded this law in 1958 to give car buyers a fair basis for comparing prices with several car dealers. If dealer “A” gives you a $500 discount, “B” a $1000 discount, and “C” a $2,000 discount you clearly get the best price from Dealer “C”. As simple as this sounds, car dealers will fight you “tooth and nail” to avoid giving you their best discount from MSRP. This is because this makes it too easy for you to buy the car at the best price. (4) Rather than arguing with a car dealer about giving you his best price or discount, use the Internet. You can use a car buying service like www.TrueCar.com, Costco Auto Buying program, or simply request a price from several dealers via email. A helpful hint is to use a fictitious name and telephone number so that you’re not “hounded to death” by car salesmen. You can also create a different, free email address using Google G-Mail, MS Outlook, or Yahoo just for this purpose. The Internet is best for getting at least 3 competitive prices because car dealers know that they have just one chance at your business over the Internet. If they refuse to give you a price or give you too high a price they can’t win your business. When you choose what “appears” to be the best discount from MSRP, call the dealership and verify that it’s the “out-the-door” price with only state sales tax and state license and registration fees added. Another word of caution is that dealers often try to hide “dealer fees” by labeling them to sound like government fees related to your license plate and registration fees such as “electronic filing fee”. If the dealer has a dealer fee, doc fee, dealer prep or any other phony fee that is not levied by the local, state, or federal government, add it to the price he quoted you before you choose his price as being the lowest. (5) Finally, never visit the dealer that you’ve chosen that has the lowest price without having shopped for the lowest finance interest rate with your credit union or bank and the highest price paid for your trade-in. You should check with at least 3 car dealers of the same make that your trade-in is. If you’re driving a Ford, visit the used car departments of at least 3 Ford dealerships. Tell the used car manager you have an “extra” car in the family and you will sell it to the highest bidder. Be sure you make it clear that you do not want to buy another car. Another good place to get a bid on your trade-in is CarMax. 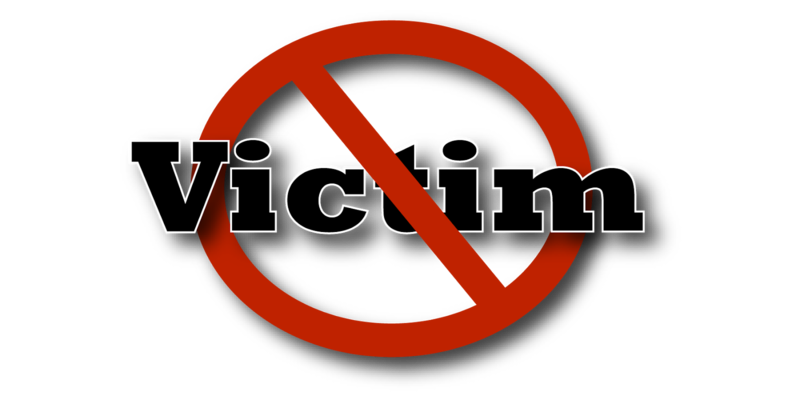 If you carefully follow the 5 steps above, you will not be a victim of a car dealer. In fact you will get a very good price on the vehicle you buy, as well as a low interest rate on your financing and the highest trade-in allowance. Too often car buyers focus on buying the car that fulfills their preferences of styling, size, and accessories that they can buy for the lowest price. There are other important cost considerations you should look at before buying the cheapest alternative. Resale value is the number one consideration that is most often overlooked by car buyers. All cars depreciate in value, but some hold their value a lot better than others. You might save a thousand dollars by choosing to buy one used or new car over another more expensive make and model. But if the make and model that cost $1,000 more, held its value by $2,000 more over the 3 years you owned the car before trading it back in, the “lowest priced car” was really $1,000 more expensive. There are several ways you can check on how much cars will depreciate. A good one is to check the resale value of that same make of car that is 3 or 4 years old. You can also find this information on the Internet. Kelly Blue Book, for example is www.KBB.com. If you are thinking about buying a new 2014 car of a particular model and make, find out what a 2011 model sells for today. Compare other makes and models. Maintenance and repair cost are the second biggest factors in measuring the true cost of a car. When a car has a relatively higher depreciation, one of the biggest reasons is probably because it is more prone to break down. Check Consumer Reports or surf the Web to find the projected repair histories of the cars you are comparing. Saving $1,000 on a particular make and model is not very significant when you are facing the cost of a blown transmission or engine. Does the manufacturer provide complimentary maintenance? This should be a factor to consider as well. Big cash rebates and big discounts are not necessarily a good thing. First you have to ask yourself, why is it necessary for this manufacturer to giving me such a big cash rebate (I have seen them advertised as high as $11,000) to sell his car? You will generally find that the manufacturers of higher quality, higher demand cars offer fewer rebates and discounts. These are also the manufacturers of cars that depreciate less and cost less in terms of repairs. Big rebates and discounts also negatively affect a cars resale value. It’s what you could call “vicious cycle”. A car is hard to sell because of its high repair costs and high depreciation so the manufacturer pays a big cash rebate to sell it. The rebate lowers the value of the used car of that make and model because the price of a used car directly tied to the cost of that same new car. You will be surprised how much the color of the car you buy can affect the resale value. Think about it. The color was very important to you when you bought your last car. It is just as important to the person who will be buying the car you trade in. The most popular colors are white, silver, beige, and black. If you have a “thing” for green, blue, orange, or another unusual color, it can negatively affect the resale value of that car by over $2,000. I’m not suggesting that you always buy a white car, but if you like white, silver, beige, and black you are going to get more money for that trade-in than if you like blue and green. Bright colors can be good for certain models. Red is a popular convertible color for example. Be sure to check your cost of insurance before you make a final decision. Cars with side air-bags, highly rated in collision and rollover tests, relatively low cost of repair especially for bumpers, and non high-performance cars have much lower insurance rates. Cars are no different than any product that you buy when it comes to the principal of “the cheapest product is usually not the best value”. You buy a quality pair of shoes, paying more than you would for a cheap, poorly made pair because they will look good and wear many times longer. Shopping for the lowest price is a very good idea, but only after you have chosen a car that has low depreciation, operating costs, and cost of repair. BUYING TIRES - "CAVEAT EMPTOR"
In case you’re a little rusty on your Latin, “Caveat Emptor” means “Let the Buyer Beware”. This is something to keep in mind when you buy anything, but the danger of being ripped off when you buy new tires ranks right up there with buying and servicing your car. Retailing tires is very important to, not only tire companies like Goodyear, Firestone, and Michelin, but independent retailers like Pep Boys and Tire Kingdom. In recent years car dealers have become very interested in selling tires too. The reason is that car customers too often don’t return for service and service is generally more profitable to car dealers than selling cars. Independent service departments and tire manufacturers’ retail service and tire outlets are taking away car dealers’ service business. Tires are something that you have to buy regularly for your car. Wherever you go to buy one or more new tires, the tire seller will take that opportunity to sell you additional services and products…you can bet your life on it. Tires have become “loss leaders” for car dealers, tire factory service stores, and independents. When I say loss leaders, I don’t mean that you don’t end up paying the tire seller a profit on the tire transaction. What I mean is that the advertised price would result in a loss to the seller if he really sold it at that price. This is very similar to car advertising. Car dealers go through a great deal of thought and effort to advertise a price which is perceived to be lower than they will really sell you the car and tires sellers do the same thing. You can be sure that you can never buy a tire advertised on the Internet, newspaper, or TV for the price that you see. To demonstrate this I chose one of the largest tire sellers in the USA, Tire Kingdom. I chose them because, as the leader, they set the pace in how tires are sold and advertised. Buying tires from other sellers, including most car dealers, will be at least as risky and often more so. I sent in a mystery shopper to two Tire Kingdom retail tire and service outlets in Palm Beach County. My shopper responded to an ad for a special sale which is blanketing TV, newspaper and the Internet. 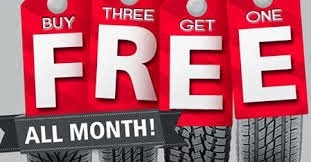 The ad says that from August 1 to August 12 you can buy one tire and get the second one free. I watched the TV ad several times and it is literally impossible to read the fine print disclosure. By going to Tire Kingdom’s website, I was able to read the fine print, but the vast majority of respondents to this sale would come from TV and be clueless to the “gotchas” in the fine print. The first revelation to my mystery shopper was that only certain makes and types of tires were eligible. No name brands like Michelin or Goodyear were available for this sale. Interestingly there was an inconsistency on this between the two Tire Kingdom stores we shopped. In fact, there were several inconsistencies between the stores on types of tires, prices and other procedures. To me the biggest deception was that the tire buyer was required to purchase “road hazard insurance” and a wheel alignment. The prices on the insurance ranged between 14% and 18% of the total price of the tires and the prices of the wheel alignment ranged from $114.99 to $79.99. The advertisement didn’t say they are advertising a package deal for tires and road hazard insurance and wheel alignments. But the fine print (indecipherable on TV) disclosed this condition. Being required to buy a four wheel alignment is wrong for two reasons. Firstly, buying a wheel alignment should be your decision and not tied to the purchase of tires. Secondly, what if your wheels don’t need an alignment? You may have had your four wheels aligned two hours ago, just now run over a nail in the road, and now have to buy a tire. BUT WAIT THERE’S MORE! The fine print also tells you that you must pay $1 per tire for the state tire tax. This is a real tax but it should be included in the quoted prices. There’s another fee you are charged which is a “tire disposal fee” which Tire Kingdom can charge you any amount they like. It’s not specified. The truth is that Tire Kingdom actually sells many of their take-off tires to used tire dealers for a nice profit. I do the same thing in my dealership and that profit off-sets my cost of having take-off tires hauled away and disposed of. And the final “gotcha” is the infamous “shop fee” which usually is 10% of the full retail price of the service invoice with a cap of $35. Now remember that there is no legal prohibition or cap on “tire disposal or shop fees”. Tire Kingdom imposes their own caps and prices on these rip offs. Other tires sellers are left to their own chutzpah and imagination to gouge you to limit of your tolerance. BUT WAIT THERE’S STILL MORE! In the fine print is “No carry-outs”. I’ve seen this in some restaurants, but it’s an unusual term for Tire Kingdom and other tire sellers to tell you that before you can buy their tires at their advertised price, you must pay them whatever they want to charge you for mounting and balancing those tires. I’ll end this article with constructive suggestions of how you can avoid these sorts of unfair and deceptive advertising and sales practices. Refuse to play the tire sellers games. Demand an “out the door” price for the specific brand and style of tires you want. Make it clear that it must include all federal, state, and local taxes, all fees like shop and tire disposal, all extra services like alignment, all extra products like road hazard insurance, and all services associated with putting the tires on your car like mounting and balancing. Ideally you should do this on the telephone and make it clear that you have only one check left in your checkbook and you will be filling it out at home for the total amount due, an out-the-door price. Of course, you should do this at least three times with three different tire sellers and buy them from the one who gives you the lowest price. So, you had an accident and called your insurance company to report it and things seemed to be going pretty smoothly….. Then you told them you were taking your car to Earl Stewart and everything started getting weird…. The claims adjusters’ demeanor inexplicably just changed…. And NOT for the better!! Suddenly they’re telling you they that have a perfect shop in mind for you that will get your car in and out in a hurry and the whole process will be effortless for you. Yep, it’ll be such a great experience, you’ll be GLAD you had an accident. You thank them politely and tell them you’re just more comfortable repairing your vehicle at Earl Stewart, where you bought the car and know and trust the people. Now it seems like the adjuster is downright angry with you and the real pressure tactics start!! They start making vague yet ominous sounding statements about Earl Stewart Toyota, almost as if they’re letting you in on a dirty little secret….. “We can’t guarantee their work….” “We’ve had problems with that shop….” “They charge more than we allow for repairs and you will have to pay out of pocket…” “If you take it to our shop, you won’t have to wait for an adjuster…” “They ignore our estimates…” The list goes on and on, but, they’re planting their seeds of doubt…. And now you’re concerned and thinking “Earl Stewart Toyota must have done something to cause this hostility by my insurance company…”, after all, your insurance company only has your best interest in mind…..
Well, you’re right, we DID do something to cause your insurance company to hate us and I’d like to tell you what….. We actually had the audacity to tell your insurance company something that they’re not used to hearing…. “NO! !” and they reacted like any spoiled 3 year old would who’s never heard the word before. But wait, you’re still “in good hands” right? Wrong!! Your insurance company will instruct “their” repair facility to install untested aftermarket crash parts on your vehicle, even knowing that these parts can absorb crash energy differently and affect the timing of your air bag deployment, resulting in possible death and serious injury. Here’s the really crazy thing…. The insurance company’s “approved” repair shop will do it!! Do you see what’s going on here? Everybody’s making out like Jesse James!! The insurance company is saving money, the body shop is making money, and you? You’re getting scammed!! Your insurance company has been provided with countless documents, provided by the vehicle manufacturers that state that these “cosmetic crash parts” are actually “designed and tested as part of the overall vehicle and may help send impact energy to the SRS sensors. In addition, some of these parts may help GM, Chrysler, Ford, Toyota, for Nissan vehicles comply with several Federal Motor Vehicle Safety Standards (FMVSS) including hood intrusion in the passenger cabin, preservation of proper door operation following a collision and proper airbag function. You may be thinking “Well, if these parts are that bad, surely there’s a law against using them without my permission…” You’re right again!! Florida statute 626.9743 states “An insurer may not require the use of replacement parts in the repair of a motor vehicle which are not at least equivalent in kind and quality to the damaged parts prior to the loss in terms of fit, appearance, and performance.” Sounds like an open and shut case, eh? The law doesn’t say “if the insurance company believes they’re the equivalent”. It doesn’t say anything about “if the insurance company hopes they’re the equivalent”. The insurance companies need to prove these cheap parts are the exact equivalent to the original factory parts to be in compliance with the law or stop mandating their use. Right? I thought so too…. So, I wrote a letter to the Florida Office of Insurance Regulation!! Went right to the top, straight to Commissioner Kevin McCarty (well, his office anyway…. he’s got “people” for that…). After much arm twisting via the Florida CFO’s office, the FL OIR begrudging agreed to “investigate” our concerns. After a couple of months, we received their response “We have concluded our investigation and found no violation of the Florida Insurance Code.”, and my favorite part…. “Generally speaking, the burden of proof that an aftermarket part is not of like kind and quality or as safe as an OEM part rests with the one making that assertion, as opposed to one having to prove that the aftermarket part is of like kind and quality and as safe as OEM.” Huh?? That one left me scratching my head. Why have a consumer protection law at all then? Your insurance company can mandate the usage of any part they desire, so long as it looks the same. Nobody really complains though because, as they say, “dead men tell no tales…”The jury’s still out on this one, but rest assured WE WILL NOT USE AFTERMARKET PARTS TO REPAIR YOUR VEHICLE.! (p.s. Also check out Title 49, Chapter 301 Subchapter II Sec. 30122 "Making Safety Devices and Elements Inoperative" in the Federal Code-you can Google it). How about used crash parts then?? Your insurance estimator will tell you “they’re factory original parts taken off of a car that’s just like yours”. Really? Was your car damaged so severely that it was deemed a total loss and ended up in a junk yard? The car they want to cannibalize to get your replacement parts was. We won’t even know if the donor car was damaged in an accident, a flood or even a fire and quite frankly, we don’t care-WE’RE NOT GOING TO USE THESE PARTS EITHER!! Well, what about Earl Stewart overcharging for labor??? THAT sounds pretty shady….. let’s talk about it…. I recently had my lawn mower repaired and it cost me $65 per hour and having an electrician fix my air conditioning at home cost me $75 per hour (plus gas & travel time), plumbers and a/c repairmen are $100+ per hour. If you have mechanical work on your car, it’s liable to cost you anywhere from $100 to $200+ per hour, depending on the repair shop and type of car. The insurance companies feel that $42 an hour is more than fair to have your collision damaged vehicle repaired and they won’t pay a dime more. If you want to repair your vehicle here, they will tell you that you’ll have to pay the difference out of pocket OR, well….. they know a guy…… Ironically, back in the early 70’s, when Allstate and Sears were all part of the same company, Sears wouldn’t repair your toaster for less than $12 an hour while at the same time Allstate wouldn’t pay more than $7 an hour to have your vehicle repaired. Hilarious, ain’t it? Back in the 60’s, the insurance industry running roughshod over the repair industry was so pervasive and blatant that the Kennedy Administration tackled them before they even got started on the Mafia!!! (see 1963 Consent Decree-Google is your friend) What the insurance industry is doing to the repair industry is a clear violation of antitrust laws and we are part of a class action lawsuit to try to put a stop to it. WE WILL NOT MAKE YOU PAY THE DIFFERENCE IN LABOR RATES!! Then we get to “charging for supplies and labor operations not customarily charged for in the market area”. This basically means that because they’ve been able to badger, coerce and intimidate some repair shops into not charging for certain supplies and labor operations necessary to return your car to pre-accident condition, they should not have to pay it to anybody whether they ask for it or not. Your insurance company won’t dispute that the materials are being used or the labor operations performed, nor will they dispute the necessity. Their only problem is having to pay for it because at some point, long ago, somebody “cut a deal” to get more business sent their way and it then became the “new norm” for every shop. We will never charge for a labor operation or supplies that cannot be verified. WE WILL NOT MAKE YOU PAY THE DIFFERENCE. Now you’re probably saying “I never get into accidents so I can’t believe I’m still reading this. Can this guy just get to the point? ?” and the answer is “YES! Yes I can! !” Please don’t fall victim to your insurance companies scare tactics! 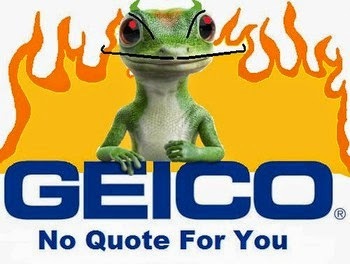 The top 5 insurance companies spent over $4,000,000,000 (yep, that’s $4 BILLION) last year to convince you that they’re good guys so that you will buy their product (GEICO alone spent over $1 Billion if that tells you anything). Sometimes, there’s not enough perfume to cover up a smell and not enough lipstick to pretty up a pig and this is one of those times. If you have already had your vehicle repaired at one of these direct repair shops and you’re not exactly sure how your car was repaired, bring it by with the invoice and the final estimate and we’ll be glad to take a look at it for you. If the vehicle has not been repaired properly, we’ll point out the deficiencies so that you can return to the shop for corrective repairs. If they repaired your car with aftermarket or junkyard parts, you may be entitled to higher than normal diminished value compensation. WHAT?? Your insurance company didn’t tell you that your car is worth less now and you’re entitled to additional compensation?? You might want to contact Gordon and Doner, they have a division that can handle that for you. If your insurance company has pressured you to not have your car repaired at Earl Stewart Toyota, please email me the details at alann@estoyota.com or Mr. Stewart at earl@estoyota.com and share the gory details. Earl Stewart Toyota will repair your vehicle properly, per the manufacturers’ recommendations and only with new OEM crash parts. We will guarantee our paint, our workmanship AND the OEM replacement crash parts, for as long as you own your car. That’s right, I said AND THE PARTS!! The manufacturers’ warranty for replacement parts is 12 months or 12K miles. Earl Stewart Toyota will pick up the warranty after Toyota’s warranty expires, this includes parts, materials and any necessary labor to paint and install the failed part. Everything!! If we are unable to convince your insurance company to pay in full for the properly repaired property damage, with your written permission we will initiate action on your behalf to recover the funds. Ultimately, it is YOU who are responsible for ensuring your vehicle is repaired properly. You already had an accident; don’t let your insurance company force you into making a mistake.